Paulo Coelho, a Brazilian author, famously known for his outstanding work his novel, The Alchemist . The novel is base on the journey of a boy in search of his dreams. The Alchemist has won numerous awards and has sold over 200 million copies world wide. In childhood Coelho showed his interest for becoming a writer to his mother, but the little boy was being ignored by giving example of his father being an engineer. Little Coelho was a misunderstood son who faced several hurdles including serving a time of over three years in mental institutions from where he tried to ran away three times until he was set free at 20 years old age. 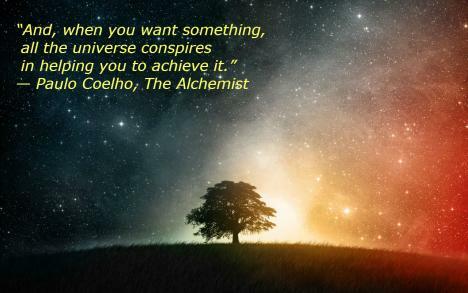 Nobody had idea about little Coelho being an amazing and outstanding Author in further future, here are some of his master quotes from his most famous novel “The Alchemist” which will make you to think of life in a different prospective. Here are some paulo coelho quotes from the alchemist. When you want something with great compassion and great desire the whole world seems to help you in achieving your aims and goals. It all starts in within yourself, it’s your inner will where it all starts. This is one of the best pailo coelho‘s quotes about love i’ve ever known. Love doesn’t need any proof, explanation, identity and expectations. Love is the most noble feeling in the world for human. Love doesn’t need any reason to be done, you don’t need any reason to love your Mother, Father or a cat you just love you don’t need any reason simple as that. Paulo coelho quotes on life are wonderful. This is one such quote from the great men. Fear is the state of mind, fear pulls you down in every aspect of life. In order to move forward we have to throw out our fears, if we fear to dream than it will be impossible to achieve it. It all start with the end of fear in ourselves. Also check some best bruce lee quotes for inspiration. The quote teaches us to stand up back again every single time we get knocked down. We do not fail until we think we lost, nobody can beat you but yourself. Secret of the life lies in standing up back again with more strength. You get knocked down, stand up you get knocked down again, stand up again until you win. Everyone has got an perfect idea to tell others on how to live life. we are good at judging, we are good in fixing problems of others. But when it comes to our problems we loose to figure out solutions for ourselves. We are very weak at finding flaws in ourselves. We can not get back our past, the future is also not ours. Thinking of these two in none less than just waste of time , se can make our futures better and past memorable by living in present. The present is in our hands the one who thinks of the past and future so much, the happiness will only be a dream for him. Happiness respect of the ones who live for today. When you are aware that you cannot go back, thinking about going back will be foolishness. Instead of regretting the situations one should think the way out of it. The only way out is moving forward. Complex things and the simplest, and extraordinary are the ordinary ones it just needs a vision to identify. The vision which a wise man holds. Quotes on love is one of the most widely looked topics. We have some good collection of love quotes from Socrates here. Now, lets checkout some outstanding quotes about love by Paulo Coelho. Perfect people don’t drink, don’t lie, don’t cheat, don’t fight, don’t complain and don’t exist. Paulo Coelho finds a remarkable way of explaining that there are no perfect people in this world. He stresses on less important things at the beginning and states a strong point in the end. What a master mind. Last Night a Player Saved the Life of a Player of the Rival Team. I read this article and found it very interesting, thought it might be something for you. The article is called 9 Best Paulo Coelho Quotes to Inspire You and is located at http://www.videoinspiration.net/blog/paulo-coelho-quotes/.